Wild rose bushes come alive during the spring and show their beauty throughout the summer and into the fall. With clusters of fragrant blooms in colors of white, pinks and reds, these roses have to be pruned in order for them maintain a definite shape. Without pruning, wild rose bushes will grow and spread, and will easily cover a large area with unorganized, thorny foliage. 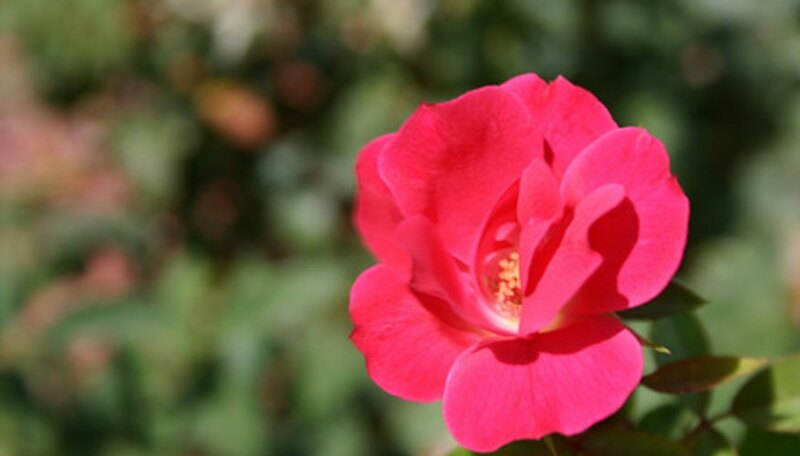 Much like a standard rose bush, wild rose bushes are straightforward to prune and maintain. Clean and disinfect the pruning shears by wiping them thoroughly with a clean cloth saturated in rubbing alcohol. The cleaning will keep you from spreading disease from one plant to another when pruning. Prune the wild roses in early spring before the plant begins to form buds. Prune away dead or dying growth on the rose bush. Cut out any canes that overlap or rub each other; cut back these portions of growth to where they join the main cane of the bush. When pruning other areas of the bush, make the cut(s) above any buds. Do not remove the buds, as this will be be where new growth sprouts. The best results come from pruning if make your cuts on a 45-degree angle. Do away with the clippings from the pruning. Adding them to a compost pile, or burning them, will be sufficient. Leaving the clippings on the ground under and around the rose shrub can kill grass and any other plants growing around the base of the wild rose bush.